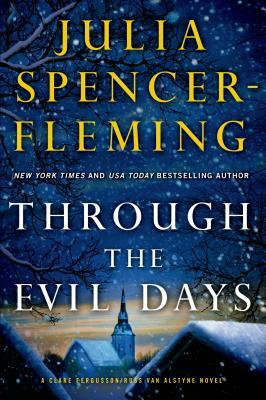 In Through the Evil Days, New York Times bestselling author Julia Spencer-Fleming raises the stakes for Russ and Clare, putting their new marriage, their unborn child, a missing teen, and their very own lives on the line. On a frigid January night, Chief of Police Russ Van Alstyne and Reverend Clare Fergusson are called to the scene of a raging fire. The extent of the tragedy isn't known until the next day, when the charred remains of a man and woman are recovered—along with evidence showing they were shot execution style. St. Alban's Church is still in turmoil over the Reverend Clare Fergusson's news that she's five and a half months pregnant—but only two and a half months married. Worried her post-deployment drinking and drug use may have damaged the baby, she awaits the outcome of the bishop's investigation into her "unpriestly" behavior: a scolding, censure, or permanent suspension. Officer Hadley Knox is having a miserable January as well. Her on-again, off-again lover, Kevin Flynn, has seven days to weigh an offer from the Syracuse Police Department that might take him half a state away. And her ex-husband's in town—threatening to take custody of their kids unless Hadley pays him off with money she doesn't have. As a deadly ice storm downs power lines and immobilizes roads, Russ and Clare search desperately for the truth about the missing child, but the hunters will become the hunted when they are trapped in the cabin beside the frozen lake and stalked through the snowbound woods by a killer. JULIA SPENCER-FLEMING is The New York Times bestselling author of One Was A Soldier, and an Agatha, Anthony, Dilys, Barry, Macavity, and Gumshoe Award winner. She studied acting and history at Ithaca College and received her J.D. at the University of Maine School of Law. Her books have been shortlisted for the Edgar, Nero Wolfe, and Romantic Times RC awards. Julia lives in a 190-year-old farmhouse in southern Maine.